Augmented and virtual reality for local television stations has been a topic of conversation amongst news directors and creative service directors for the past few years, as technology continues to advance and prices continue to fall. So, how does it fit into the broadcast? Well, that’s a complicated question that usually starts with budget and manpower. From there, it all depends on creativity and the comfort level of the stations creative talent. 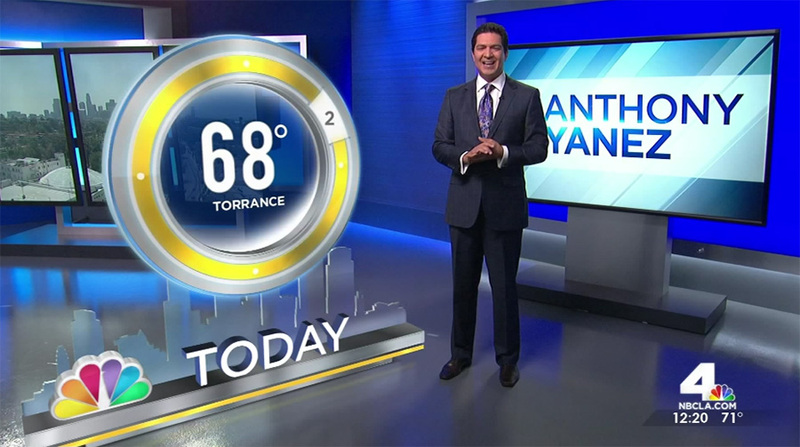 Basic augmented reality systems start around $50,000, depending on the manufacture and camera tracking system used, and allow broadcasters to enhance weather presentations, virtually insert show logos and graphics (such as with KNBC-TV’s “The Challenge”) and even build upon their set design. “This is one of the trends that we are seeing right now in the industry. It’s coming from the fact the competition between the broadcasters is growing,” said Ofir Benovici, senior director of broadcast products at Avid. The more complex systems require a greater level of camera tracking, which of course, adds more costs to the equation of feasibility. KABC-TV and WLS-TV, both ABC Owned & Operated stations, are in the process or have systems in place for augmented reality graphics, with KNBC-TV using it since early 2015. With many station groups using centralized hubs for graphics production, the capabilities are both limited and limitless. On one hand, it ties the hands of local stations by providing less “on the ground” resources to make graphics and implement new ideas. But, it also gives you the power of a team of talented graphic artists with pooled resources. So far, station groups with hubs have only tip-toed into this world, with many, like Media General, exploring their options for the future. Many hubs are fully loaded with “daily” graphic work, making augmented reality hard for normal stories, leaving it more realistic for elections, or special events. Manufactures like Vizrt and ChyronHego also offer pre-built options that allow quick turnaround and simple setup for augmented reality in broadcast. Of course, these solutions rely on templates, and may not reflect the stations branding, on-air style, etc., but offer a realistic and easy path to air. For special events, like the upcoming 2016 Presidential Election or the Summer Olympics in Rio, templates make sense. As cost declines, more stations will look to add flexibility to their storytelling with new technology. Such was the case with the rush to touchscreens (with solutions like AccuWeather’s StoryTeller now in over 200 stations) and the same can be expected with augmented reality graphics systems. Of course, overseas, this technology has had wide adoption for a decade, with many broadcasters using it for daily stories and not just special events. Nationally, CNN uses augmented reality with Tom Foreman often (such as with its coverage of MH370 or in the ‘New Day’ studio). Others have yet to use the technology at this level, restricting its use to elections. Like any up-and-coming technology, it must be used to enhance the production values of the broadcast, and not thrown into the mix as a gimmick. So far, the uses have mostly done that, by extending a virtual layer to increase storytelling and help break down complex stories and data. “You want to differentiate your broadcasts from your competition, immersive graphics and augmented reality help that,” said Benovici.